Detailed break down below which is updated weekly. 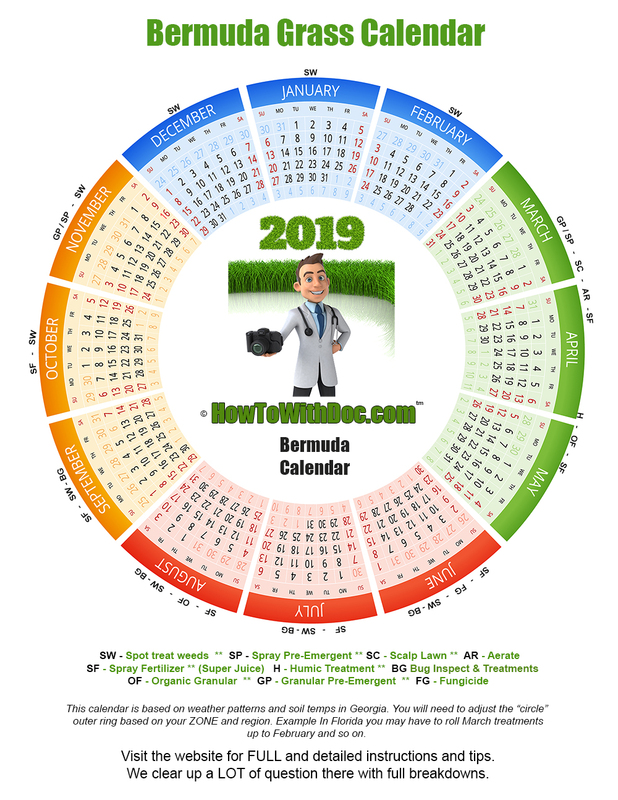 The 2019 Bermuda Grass Calendar is a month by month / season by season and step by step guide to Bermuda lawn care. Doc walks you through what to do and when on your Bermuda grass lawn. 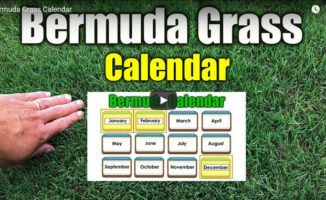 The Bermuda grass calendar is by far our most watch video in our Bermuda Care section. Share it with your neighbors and HOA. In the SPRING… watch for the soil temps. They generally regulate weed germination and needed fertilizers. #1 – The instructions and products listed will be updated CONSTANTLY… before you apply or buy them. Check back here first. #2 – This calendar is based on “middle Georgia” so adjust the applications based on your zone, soil temps, and general weather patterns. #3 – There is a printable reminder wheel. 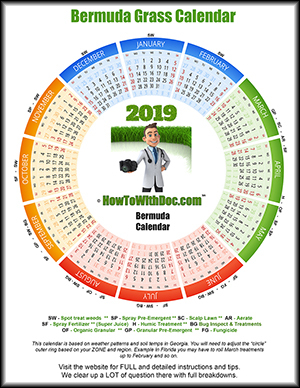 While it is the copyright material of HowtoWithDoc.com , we allow you to share it on a non-commercial / local basis. Example: Print it off and include it in your HOA newsletter or email it to HOA members. #4… This is NOT a HOW TO SAVE MONEY program. This is a program that uses QUALITY, TESTED products from reputable companies. The annual cost is about the same as hiring a “treatment company”, but you get 5 TIMES the treatments and products… and it’s done properly by you. On an annual basis you will probably spend about $35 per 1000 sq feet of lawn. DOWNLOAD THE PRINTABLE REMINDER BY CLICKING THE PIC BELOW. IT’S A PDF FILE THAT PRINTS EASILY ON REG PAPER. FOOD: As temps fall from the 90’s+ to the 80’s this is the time to get down your last feedings of the growing season. Our goal is to feed a BROAD spectrum fertilizer to promote HEALTH and store nutrients for the winter. This includes ALL N-P-K nutrients, iron, and Micros. I will put down the new organic fertilizer as well as apply super juice. I will apply the super juice every 3 – 4 weeks until the first cold temps hit. Then we totally stop feeding. PRE-EMERGE: While the grass is still GROWING and feeding I would probably put down the GRANULAR pre-emergent vs. the spray. If you’re not having weed issues, hold off on this until maybe October. IMPORTANT…. BUGS: Watch the ARMYWORM video and make sure you know how to test and treat for Armyworms. Come to find out I didn’t have a GRUB problem. 24 hours after treating 1000’s of these fall army worms started dying and being seen. My POOL is full of them now as well. NEW SOD NOTE: Stick with super juice and do NOT apply pre-emerge at this time. We will wait for cold temps. The lawn has been hit by the first frosts and cold temps. It is now going dormant and mostly brown. PRE-EMERGE: Use a pre-emergent that will work on winter weeds and grasses such as pos annua. Doc uses a spray and puts down the MAX allowed by the label. 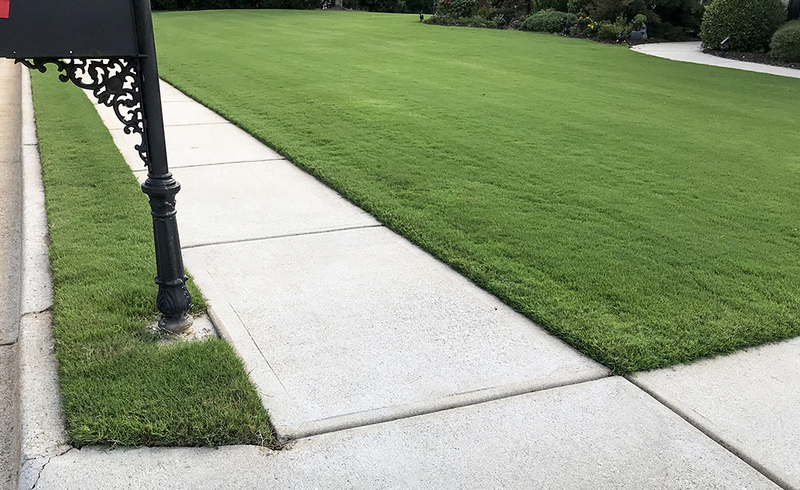 SPOT TREAT WEEDS: The fun part about this time of year is that the Bermuda grass is dormant and we don’t have to worry about it, so you can spot treat all you want. Relax…….. your grass is asleep. This is where you have to use your JUDGEMENT and research for your exact area. Soil temps and beginning / new growth will tell you WHEN to do a few things. This and SPRING are often the keys to a great summer lawn. Make sure your pre-emergent is down well before the dates below. This is NOT the time to be applying GRANULARS FYI… as we will be scalping the lawn and much of that will be picked up or moved. We want to use sprays as much as we can. Put down spray pre-emergent first… then start applying super juice. I will put down super juice every 2-3 weeks in the 7-1-2 ratio. Once your lawn is showing GREEN all over, that is when you want to scalp. Note: I do mine too early most years but it works out just fine. It allows the sun to hit the soil and young grass. I have done this for years. Watch the scalp video. Most people don’t scalp low enough. I tell my lawn crew… take it to dirt boys… take it to dirt, but you know me. the dead brown grass needs to removed. In Georgia this is usually late April – May. We are keeping our lawn fairly low now, and this is a good time to aerate. Do so after a good rain and let the plugs dry. Pick up plugs if you want. Watch the video. 2- Put down heavy treatment of organic fertilizer once soil temps hit 50+ degrees. 3- Spray with super juice. Your lawn likes to have at least 1″ of water per week. During high heat and drought conditions water more often. Keep in mind that golf greens are watered 2-4 times a day… fairways usually every day… because they are cut shorter and usually have a high sand content. During severe drought periods I water my lawn briefly every morning at 5am. Again, this is during DROUGHT conditions and my station run time is only 10 minutes. I may never water my lawn for weeks if the rain fall is good enough. I DO NOT AUTO PROGRAM MY SPRINKLER SYSTEM. I use my human brain. I do NOT have issues with fungus doing this, I guess because I water early in the morning. Below is my lawn during a drought condition in August with 93+ plus heat. Put down organic fertilizer we suggest and do so every 6-8 weeks. Spray the super juice every 3-5 weeks. As soon as temps got hot and muggy watch for disease and put down fungus treatment if needed. Put down a humic treatment. 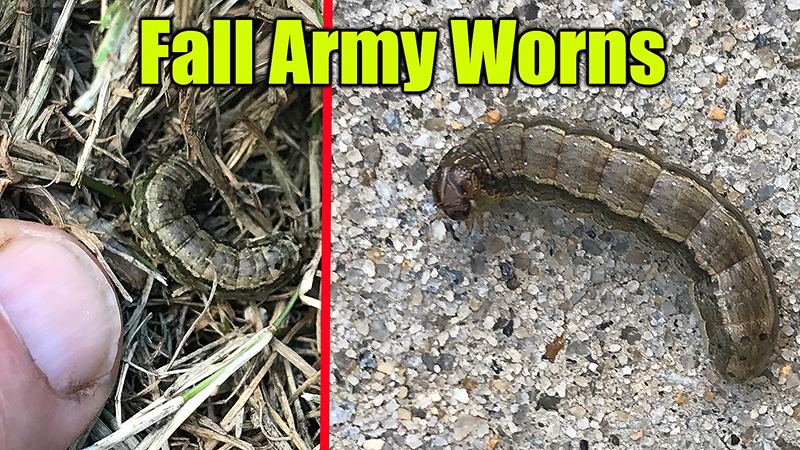 Watch for ARMYWORMS… bugs and grubs. I just go ahead and treat once a year with granular or spray. You need to inspect and treat for Armyworms starting in June or July based on your region. Once you have done those in early summer there isn’t a lot to do other than keep watered and watch for weeds. Spot treat them. 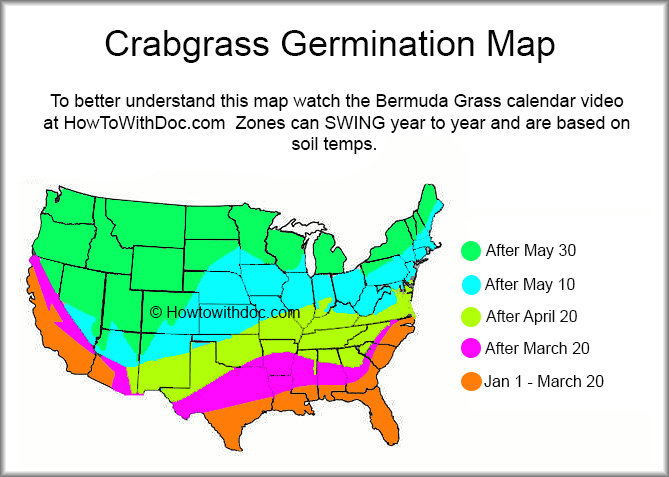 Step by step Bermuda Grass calendar. Great results… thanks for the video.